When we first moved in our new home, I was a little sad about the natural light situation. It did not take me long to figure out that the south-facing part of our home was in the shade after I returned home from work. For the last 3 years, in 3 different homes, the south-facing window was the source of my foodie photographs. While I am still trying to perfect my new photography zone, the backyard shade has a different utility: shade for our backyard patio. A welcome respite from the blazing summer sun, it almost behooves us to only invite people over for evening BBQs. And eat our dinner outside, as well. This weekend was especially hot and totally ice cream weather. 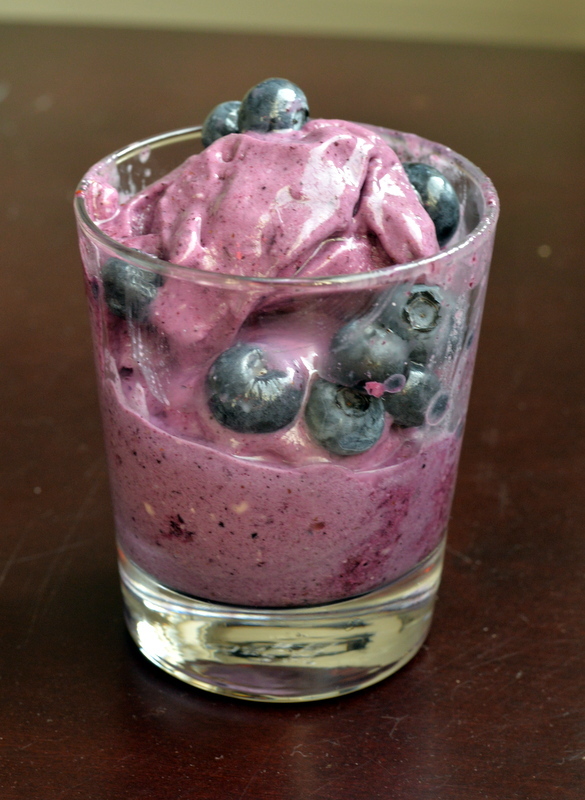 I wanted ice cream and I wanted it now, so I finally made Gena’s lovely blueberry ginger ice cream. 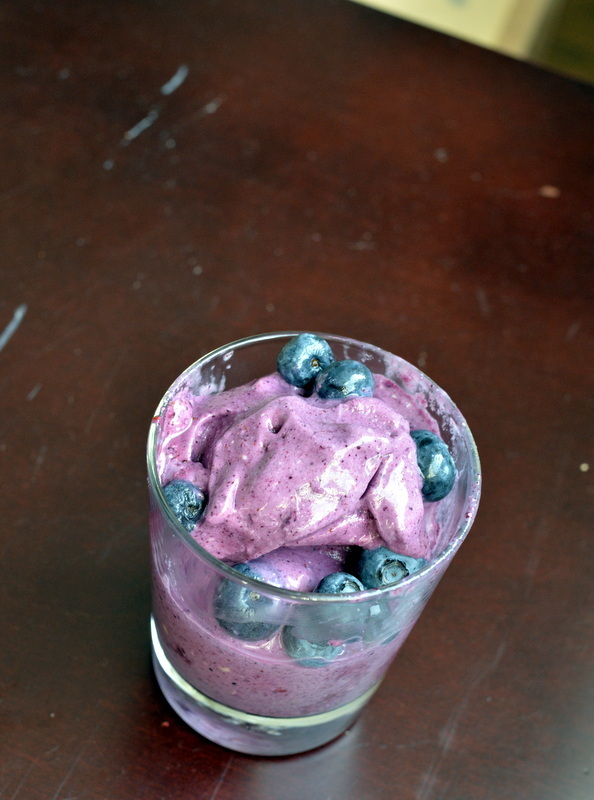 I love blueberries and I love ginger, and never would have thought to combine them. It was marvellous. The classic banana soft-serve ice cream is even creamier with cashew cream and a gorgeous purple hue from frozen blueberries (wild blueberries for the best flavour). I made this in my vitamix and was too impatient to wait for the cashews to be completely blended so they added little bits to the creamy base. Fresh blueberries were a good textural foil. In any case, this is highly recommended. Soak the cashews if you have enough forethought for a creamier base. Any fabulous treats you recommend for beating the summer heat? I am sharing this with Simple and In Season. You don’t realize how much you need things until you don’t have them. A bed? Yeah, sleeping bags don’t cut it. Chairs? Sitting on the floor is actually not that much fun. Lest I mislead you with some pre-written posts, things have been a tad chaotic since my arrival in Texas. We drive down separately from our stuff. The shipping pod that had nearly all of our belongings was 4 days late. We were only partially prepared for living without our stuff. Rob was smart enough to pack our sleeping bags in the car. However, after one night of sleeping on the hard floor, we knew that was not sustainable. We ended up visiting REI earlier than we thought, to buy two thermarest sleeping pads. Much better. Gosh, how did I ever enjoy sleeping parties as a kid?? The good thing about the pads was that I could bring them to the kitchen, too, so I had a more comfy spot to sit on the floor. 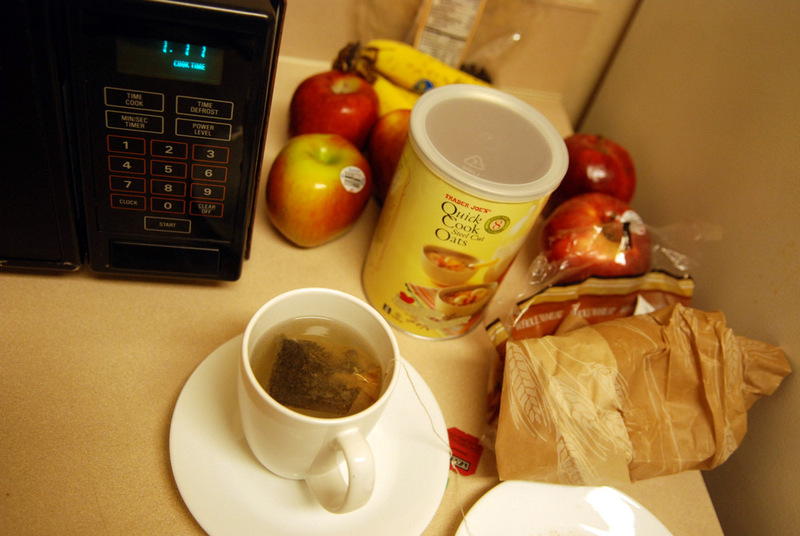 Those few days in limbo had me less focused on the kitchen. Overnight oats for breakfast and lots and lots of hummus, crackers and carrots. Trader Joe’s has such delicious hummus, no? Their chickpea Mediterranean Hummus is fabulous! I started to build up my pantry with trips to grocers (totally digging Fiesta Mart) but kept meals simple without much of a kitchen. This is my submission to Deb for this week’s Souper Sundays, this month’s Tea Time Treats for fruits and Healthy Vegan Fridays. Rob and I like to name rename things. People. Animals. You name it, and we’ll rename it. The previous tenant in the basement had a cat. A big, fluffy black cat that would watch us whenever we were in the backyard. It took us a while to figure out his name. By that time we had christened him with a new name: Muffin. A dog followed us for a few days while on our jungle trek in Colombia. Rob named him Danger Dog. After our recent Colombian adventures, our new home also has been christened with a Spanish name: Casa Tarragona. Thankfully a late summer purchase was a new tarragon plant. I first tried tarragon last year and since discovered it is an easy-to-grow perennial. Tarragon has a subtle anise flavour that I like, even though I don’t like licorice. 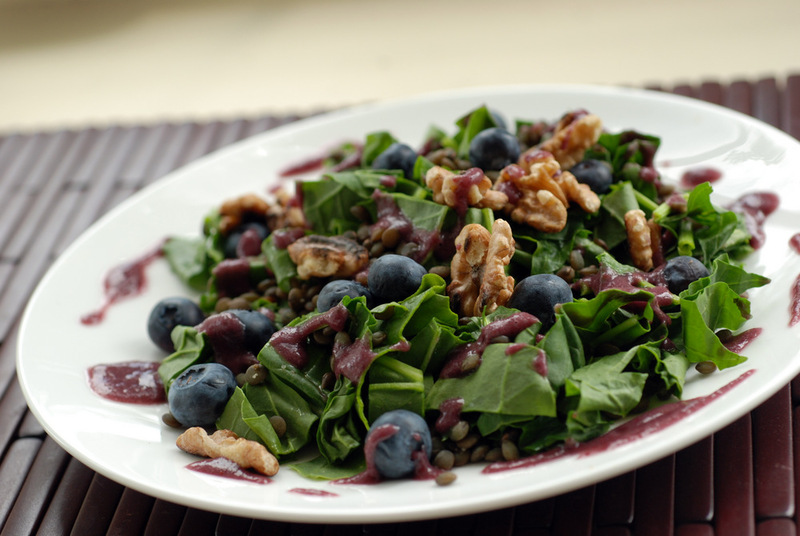 Here, I pair it with blueberries in a delicious dressing sweetened by dates. Coconut-sauteed onions make this a luscious dressing with a hint of citrus from the lemon. 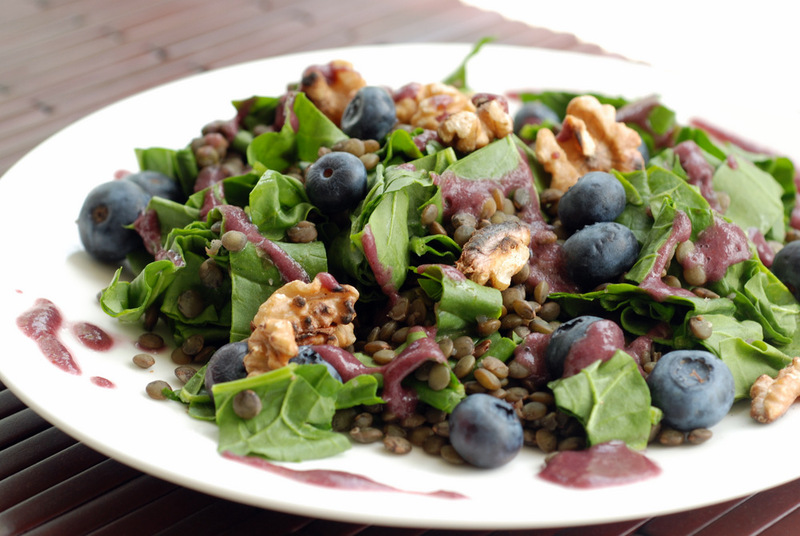 Wanting a hearty main-course salad, I paired it with French du Puy lentils and spinach. 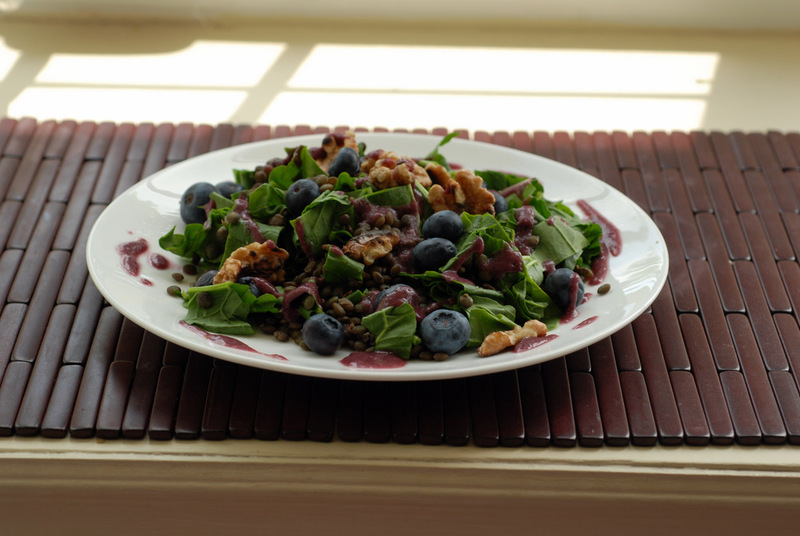 Toasted walnuts add a satisfactory crunch and fresh blueberries provide bursts of sweetness. Definitely one of my favourite salads, to date, I feel like this is definitely the summer of salads! 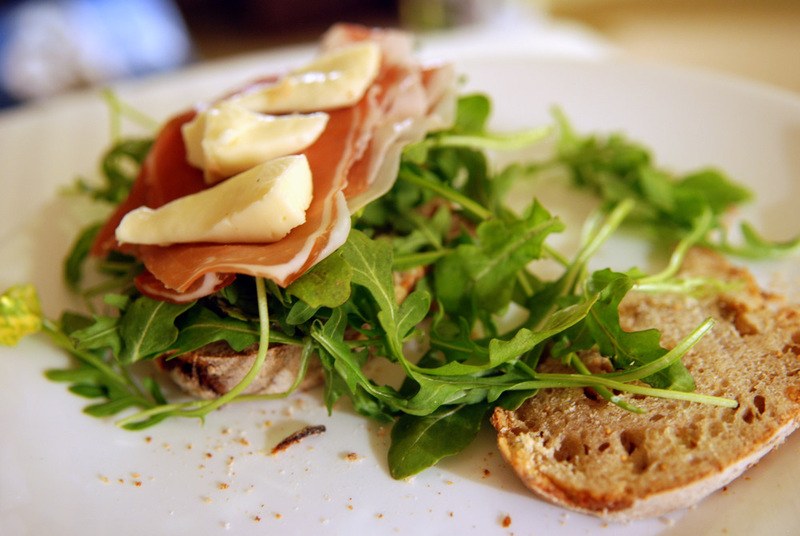 What are your favourite ways to use tarragon? This is my submission to this month’s Herbs on Saturdays, to this month’s Bookmarked Recipes, and to Deb for this week’s Souper Sundays. I planned for a stress-free brunch by making nearly everything in advance. I kind of ending up pulling out some of our normal breakfast foods (granola, yogurt, etc) along with the special crepes and pancakes. I had pimped my kale salad as the best kale salad ever, so I had that as a savoury option, too. and this Blueberry Vanilla Chia Jam. 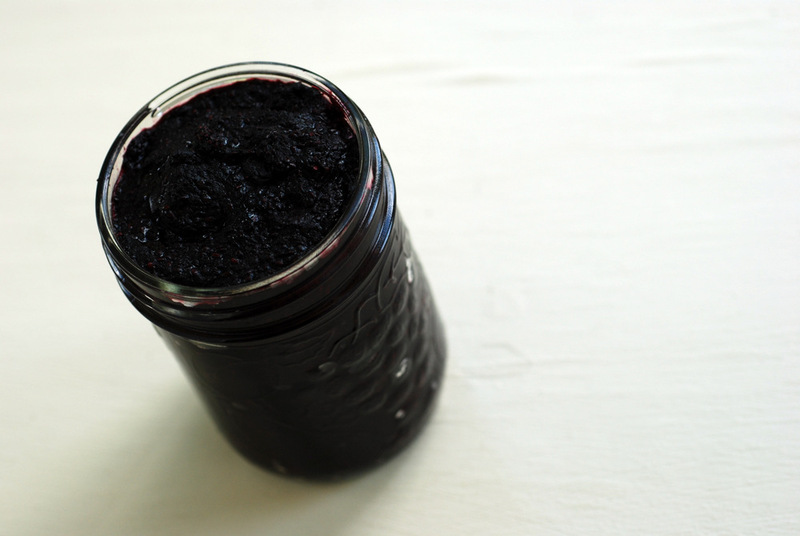 Earlier that week, I made Angela‘s Blueberry Chia Jam, so I pulled it out as another option as an afterthought. Everyone enjoyed their mixed-and-matched creations, and agreed that the jam was awesome. 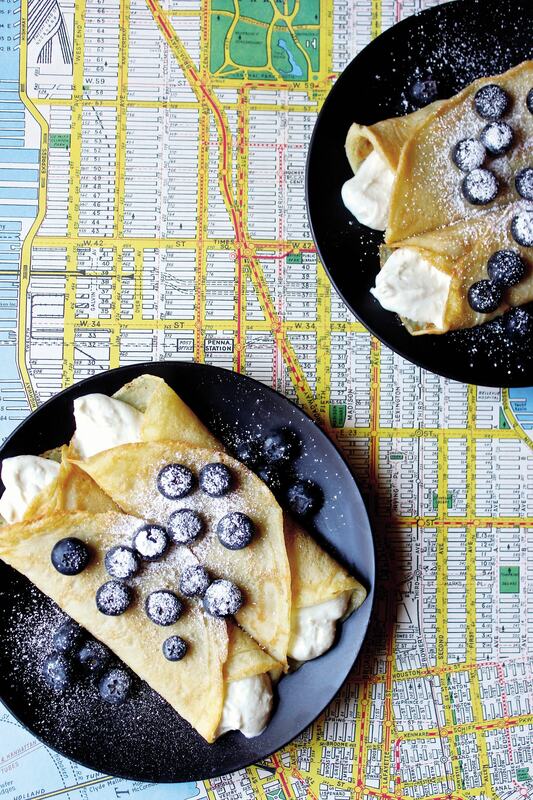 Pure blueberry bliss. 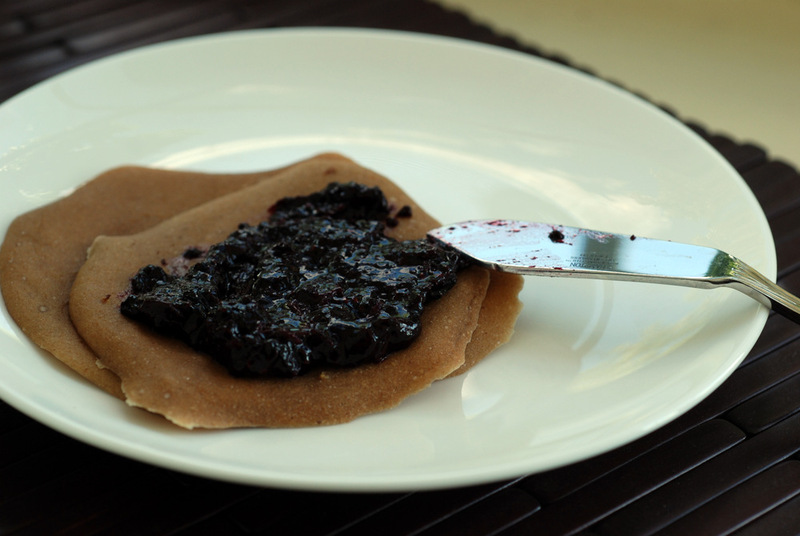 Without all the typical over-sugared pectin-laden jam, this spread is simply fresh blueberries reduced with a touch of maple syrup and vanilla, thickened with chia seeds. I was worried the chia seeds might be too slimy or crunchy, but it was neither. They blended in so well and helped make this a thicker spread. 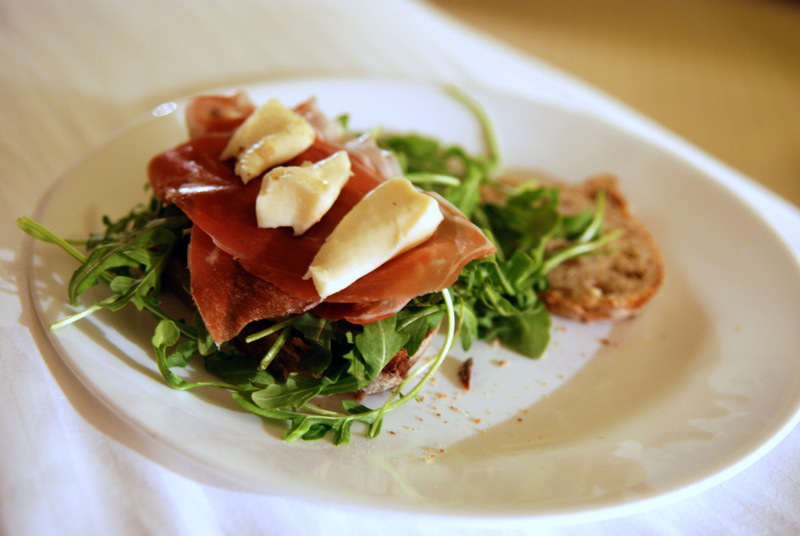 Such a simple recipe, but it highlights how fresh produce can be augmented in creative ways. 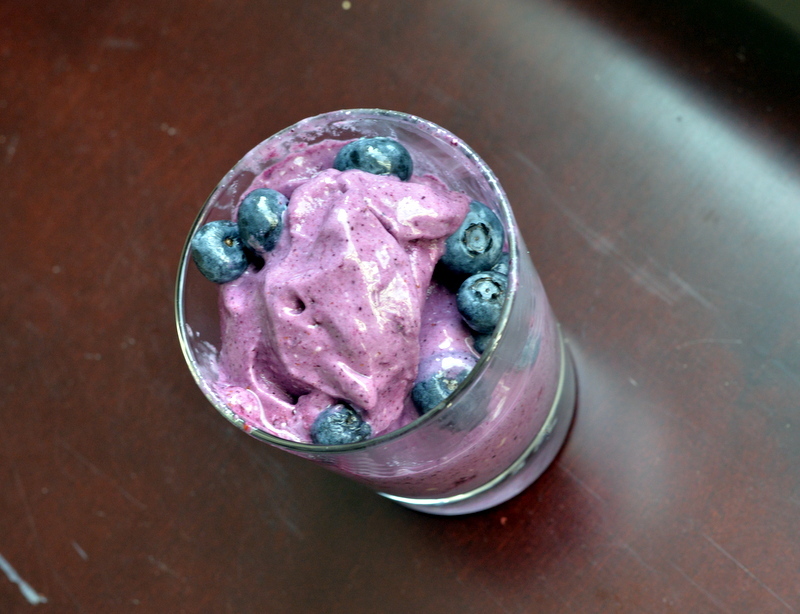 This is being submitted to this week’s Weekend Herb Blogging, hosted by Cinzia, to this week’s Ingredient Challenge Monday for blueberries and to this week’s Wellness Weekend. I swear, I don’t eat mangoes every day (Rob could take that honour for the past few weeks, though). It may seem like it, though, since I happen to be posting those recipes more quickly. While I don’t share all my recipes, I have a treasure trove of half-finished posts, some with photos, others with a story, and most of them with an ingredient list and a scribbling of my thoughts about the dish. 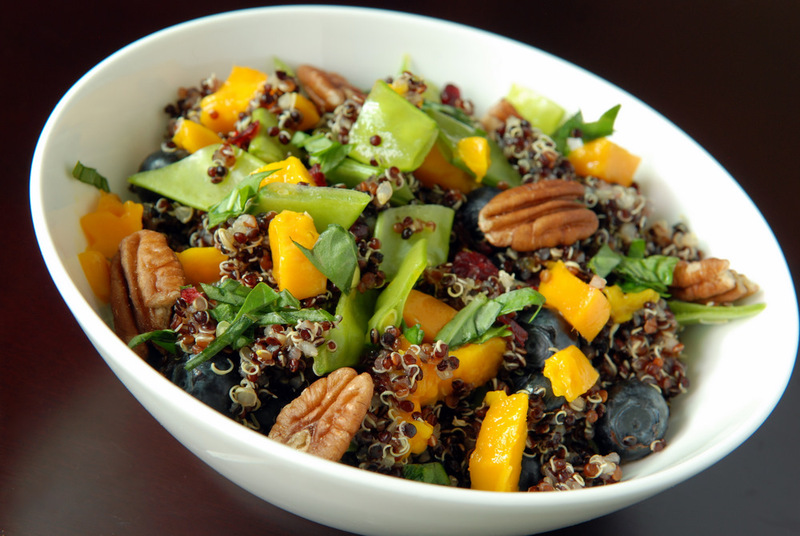 There is something about meals with mango that makes me want to share the recipe right away. 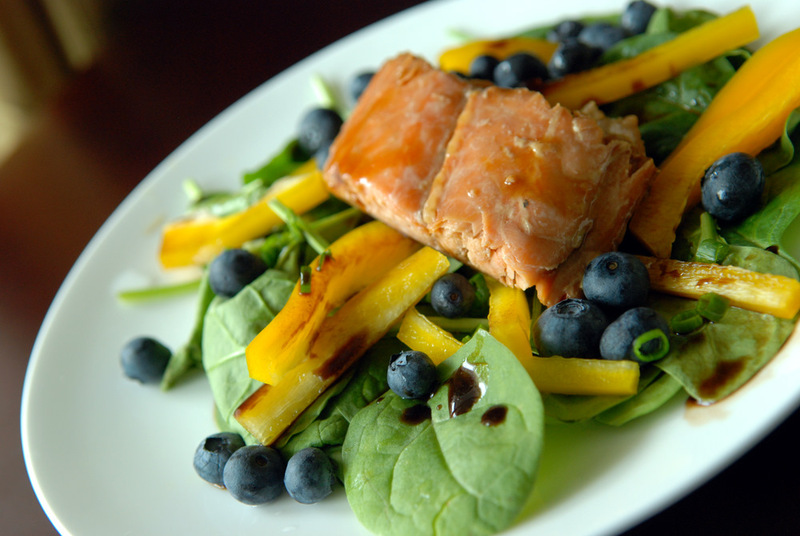 Adapted from Veggie Belly, this is savoury use of fresh mango in a beauty of a salad. 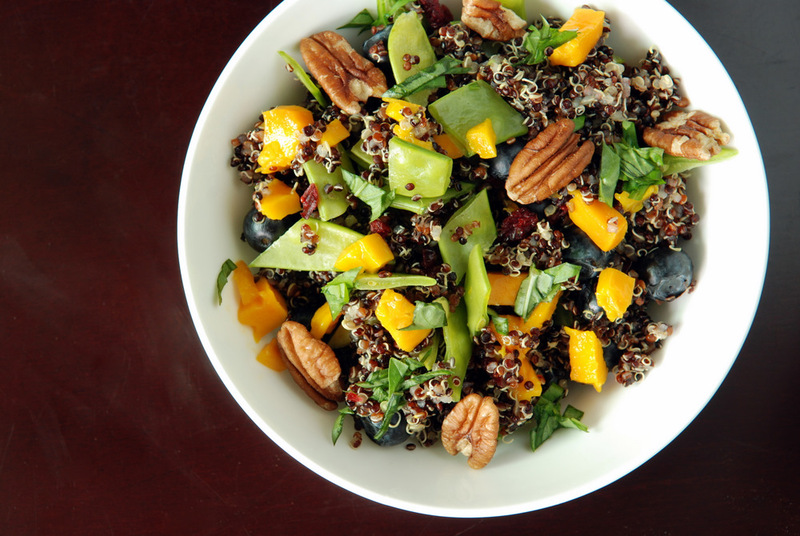 Red quinoa is combined with fresh blueberries, chopped mango and dried cranberries and chopped snow peas for crunch. 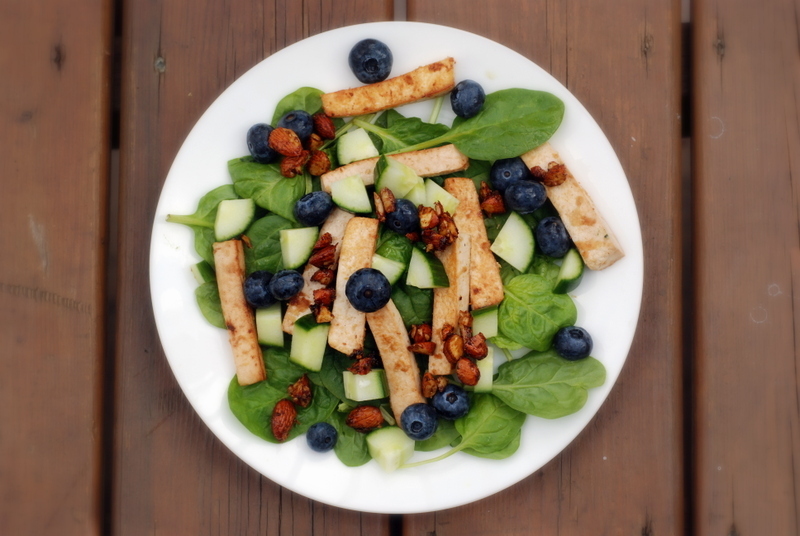 It is then tossed in a subtle lemon-basil dressing and topped with toasted pecans. Nothing is overpowering, nothing screams at you. Everything works well for a simple, yet flavourful salad. A great way to highlight different summer produce in a healthy salad. This is my submission to both Ricki and Kim’s vegan SOS challenge featuring blueberries, to Deb for this week’s Souper Sundays and to this month’s Simple and in Season. I have been cycling a lot recently in preparation for cycling from Ottawa to Kingston and back in June. Rob and I have slowly increased our daily distances, and on Sunady we cycled 168km. Terrain around Toronto can be mostly flat, so we have been trying to incorporate hills into our routes. There will be some killer hills en route to Kingston. Last year, The Toronto Star listed some scenic hills for cyclists and we have been exploring them one-by-one ever since. Two weeks ago, we conquered the brutal hill in Twyn Rivers and this week we tackled the steep and curvy hill at Appleby Line in Burlington. I have to zigzag up the hills because I can’t ride them straight – I just don’t have the gears to go that low nor are my legs that strong! We only have one more hill left on the list (Redway) but it has been fun to see different areas in Toronto. I have been making tons of different energy bars for my cycling trips and will start by sharing these healthy snacks from the Thrive Diet (original recipe posted here, and video of Brendan making them is here). I like the Thrive Diet because it highlights eating nutrient-dense foods. Brendan just came out with a new cookbook, Whole Foods to Thrive, which I am really excited to explore because the recipes seem much more creative and include a lot of recipes from established raw restaurants including Live Food Bar in Toronto, Gorilla Food in Vancouver and one of my new finds, Thrive Juice Bar in Waterloo (sadly, they didn’t share the recipe for their awesome pad thai). 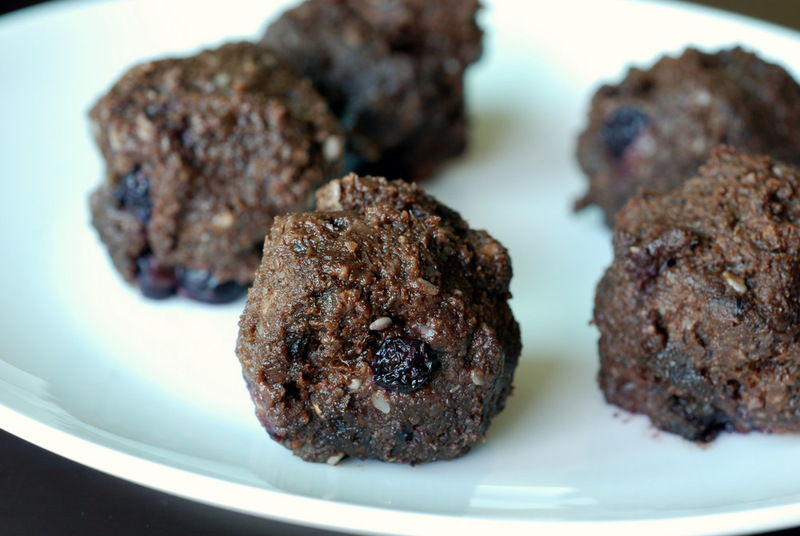 These are definitely a healthy energy bar, filled with nuts, seeds, blueberries, lemon juice and carob powder. The texture is softer than what I usually expect from my cycling snacks, but Brendan is a big proponent of your mouth and stomach doing the least amount of work while fueling up during exercise. I found them too soft to transport a bunch of them with me while biking, but they are better at room temperature after a work-out or as a mid-day snack when the munchies come! This is my submission to both Ricki and Kim’s vegan SOS challenge featuring carob. 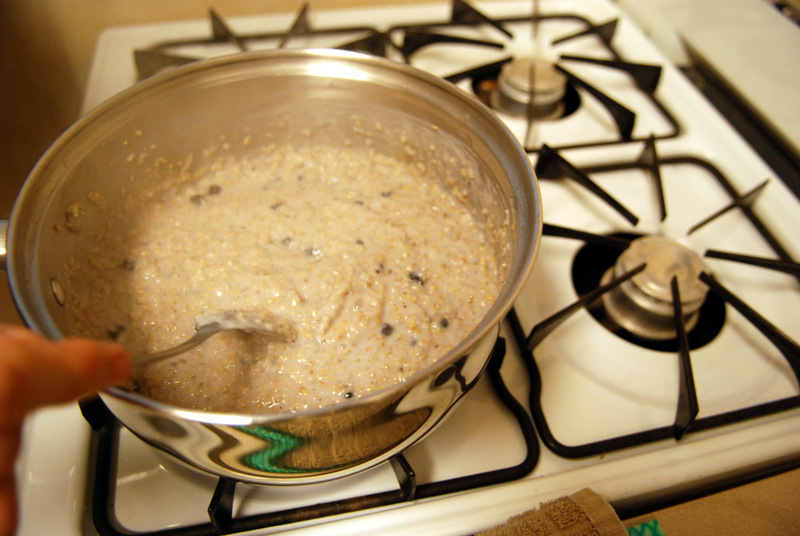 I eat oats for breakfast, in some shape or form, nearly every day. 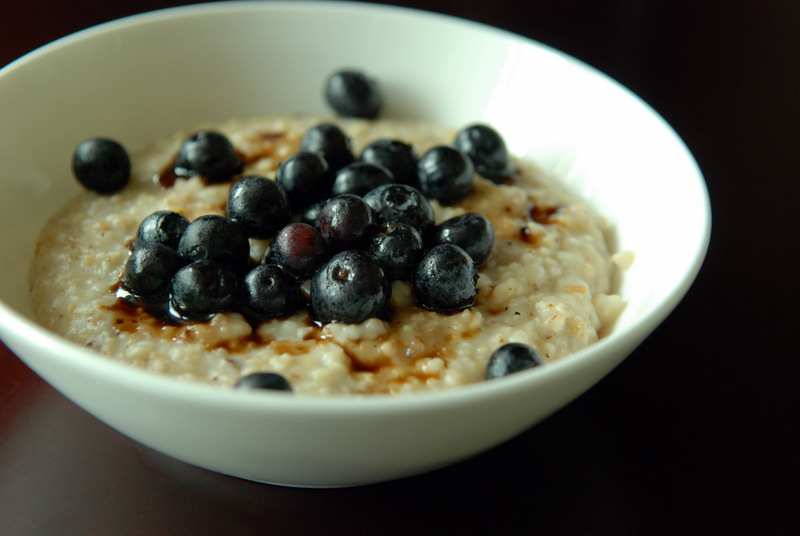 Lately, I have been enjoying steel cut oats. 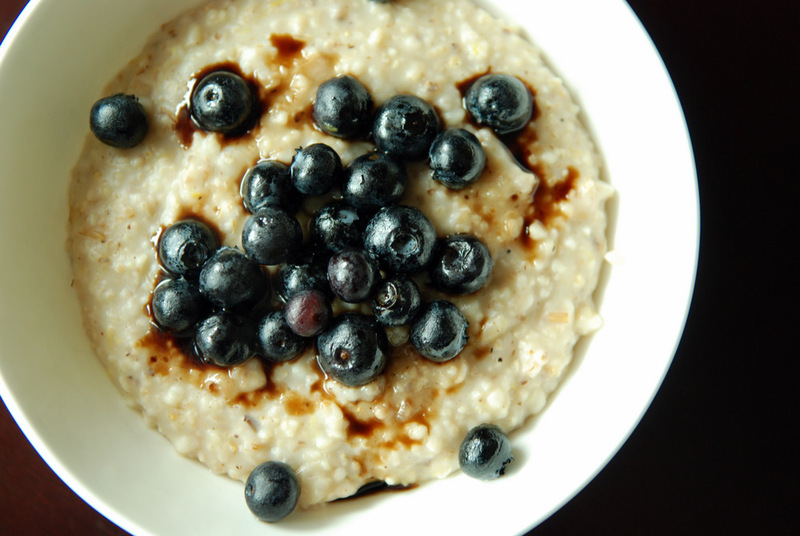 Steel cut oats are less refined than old-fashioned rolled oats, which means they retain more nutrients, but it also takes 40 minutes to cook (unless you snag some quick-cook steel cut oats from Trader Joe’s which have been partially steamed beforehand). 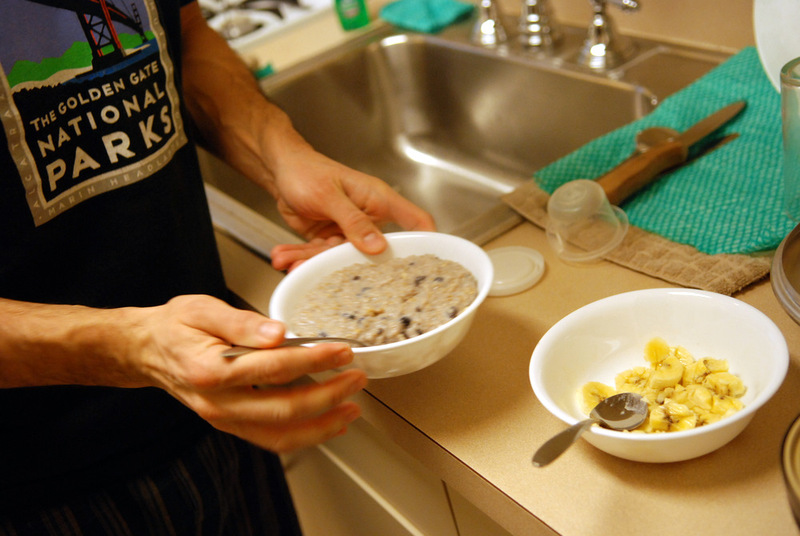 I make a big batch of steel cut oats on the weekend and reheat portions in the microwave for 60 seconds each morning. Fast and simple. 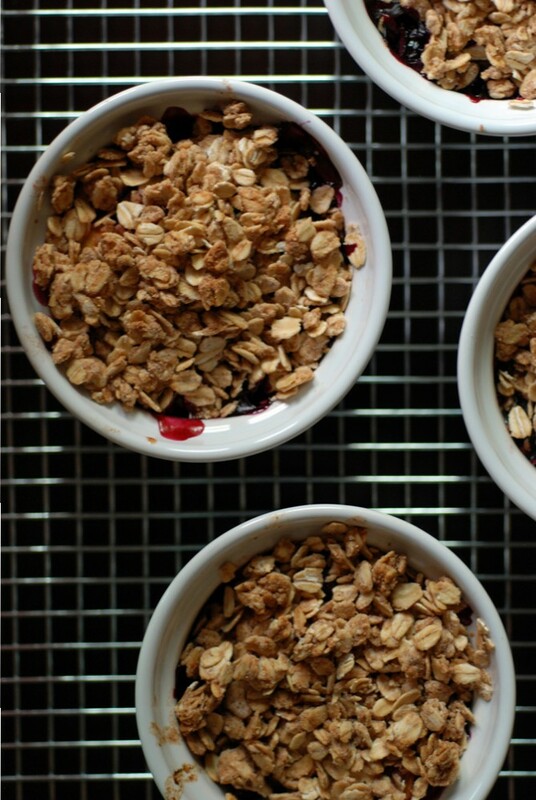 While I typically make my oats quite plain, I can add different toppings each day to the blank canvas. I went through a phase where I added pomegranate molasses. Then, I tried soy sauce and/or toasted sesame oil for something savoury. My current favourite oatmeal topping is ponzu sauce, a citrus-flavoured soy sauce. The saltiness really enhances the oatmeal. 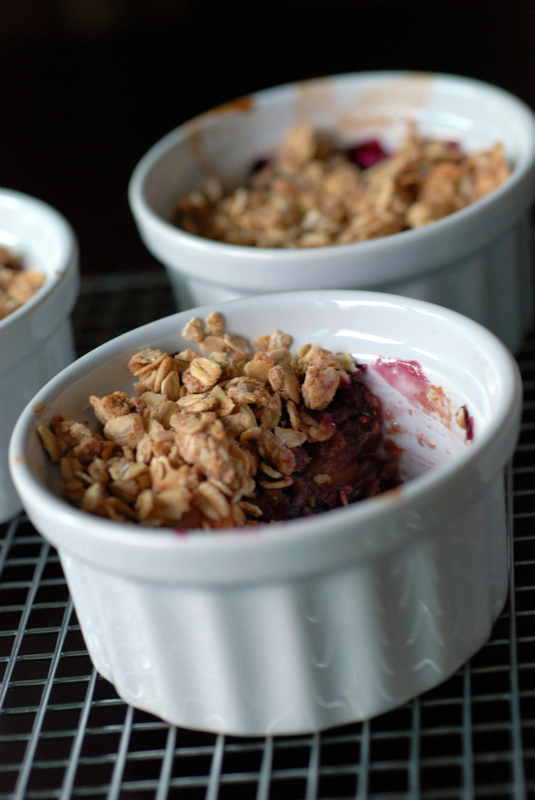 However, this weekend, I wanted to try something completely different, to highlight blueberries. 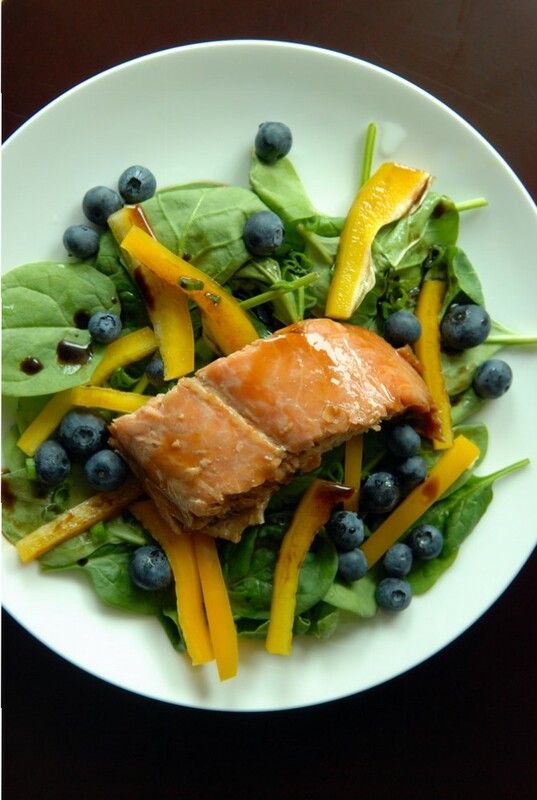 I figured a lemony oatmeal with a touch of vanilla would complement the blueberries well, and after I topped the oatmeal with the blueberries, I thought of my recent Blueberry Salmon Teriyaki Spinach Salad, so I drizzled some balsamic vinegar overtop as well. It was divine. 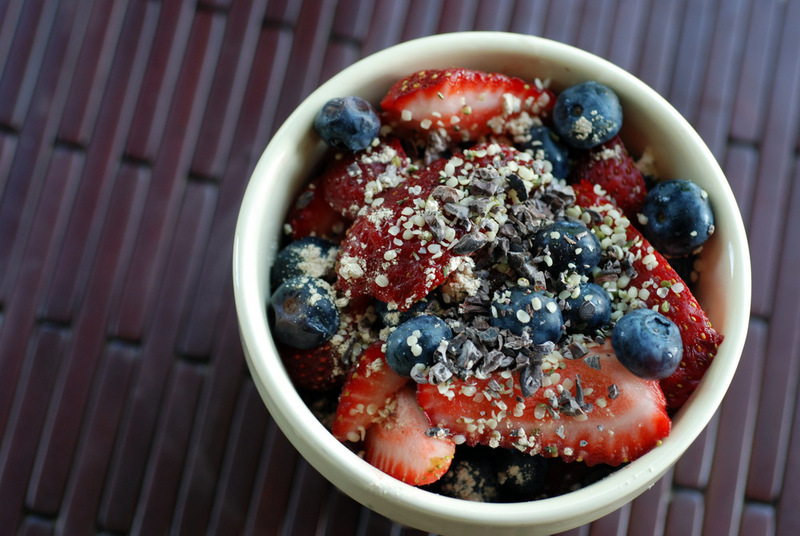 A cheery, gourmet way to start the day. 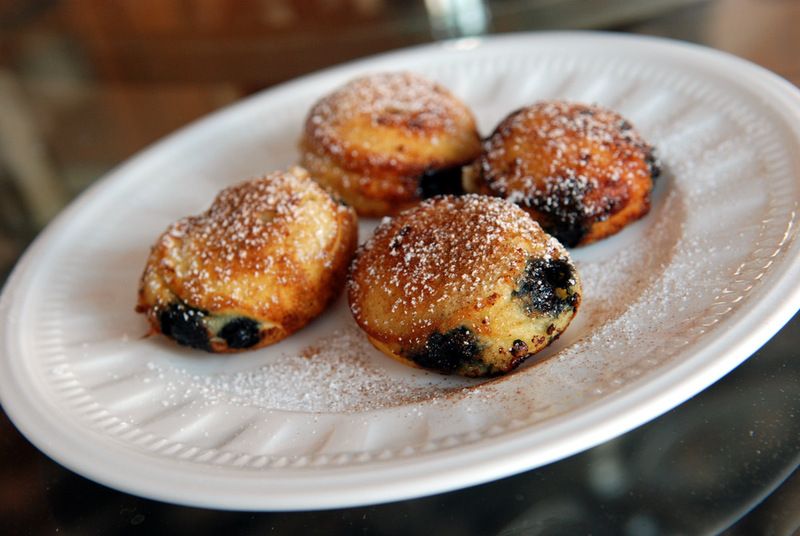 I haven’t tried yet, but I think dried blueberries could work as well when you can’t find fresh blueberries – just add them at the beginning to plump up nicely. This is being submitted to this month’s Breakfast Club, featuring whole grains (hosted by me this month). As you can probably tell, I don’t cook many meals a second time. 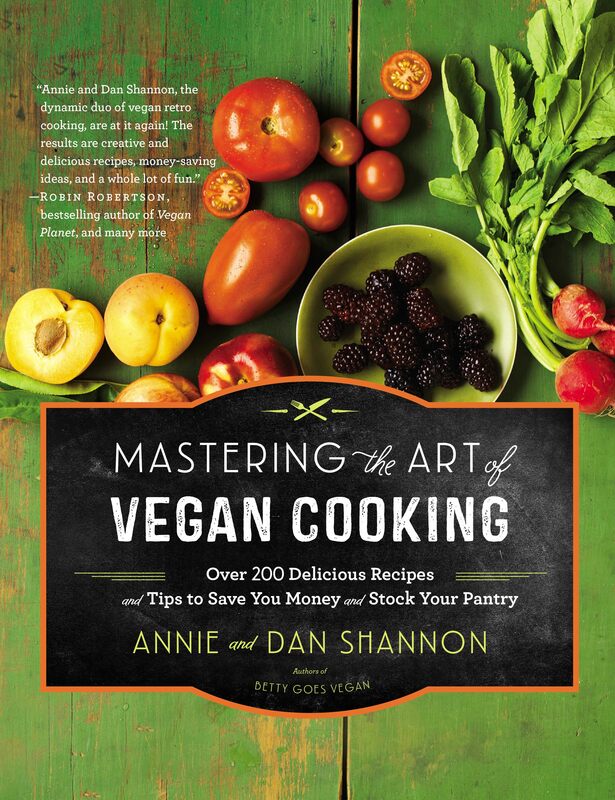 However, I have some tried-and-true recipes up my sleeve that I can whip up stress-free when entertaining. Salmon teriyaki is my signature dish. 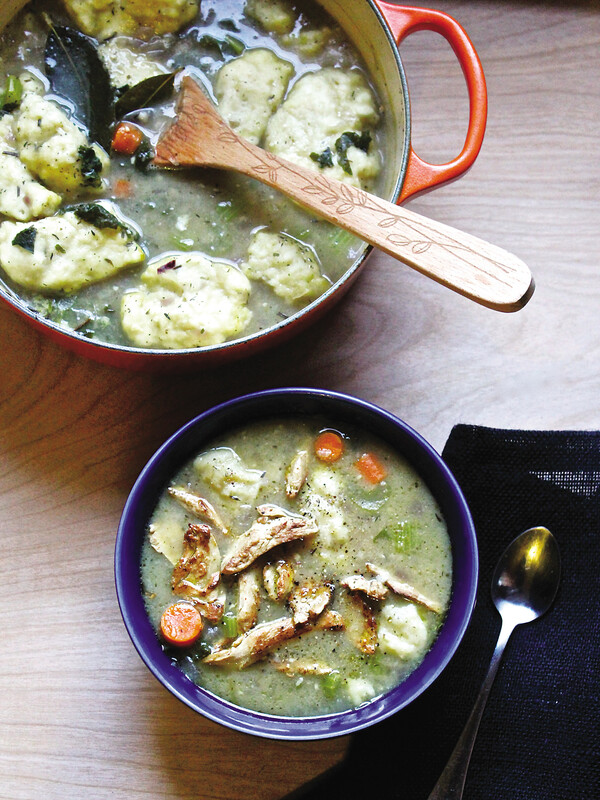 It helps that it is easy to make and tastes sublime. 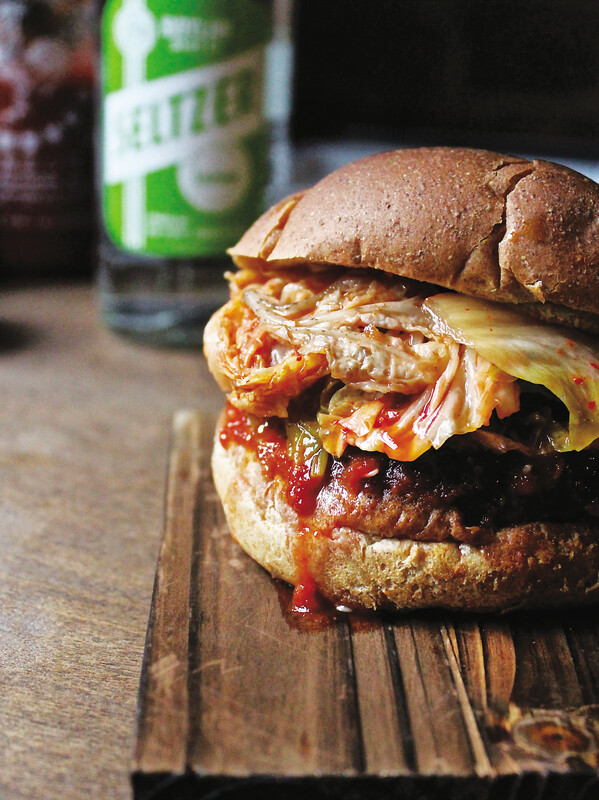 The ingredient list is simple, but with authentic Asian ingredients. Shin-mirin is definitely worth scoping out because you can taste the difference. I had forgotten how good it was until I made it for Rob’s birthday celebration – for 12 people (oh my!). Thankfully salmon teriyaki doubles, triples, quadruples AND quintuples very well (provided you have enough trays to hold the salmon in the oven, hehe). I figured 3 lb of salmon for 12 people would be adequate (4 oz per person x 12 = 3 lbs!) but suggested 4 lb in case anyone wanted seconds. Rob ended up buying 5 lbs (oh my! ), so suffice it to say we had leftover salmon teriyaki. While it is wonderful warm straight from the oven, leftovers are good, too, if kept chilled (I find salmon gets rubbery when reheated). Originally, we served the salmon with an edamame and arame salad (recipe to come) and a simple side of soba noodles tossed with toasted sesame oil, soy sauce, lime juice and sesame seeds, but I chose a different route for leftovers. I surveyed my fridge and came up with this delectable salad. 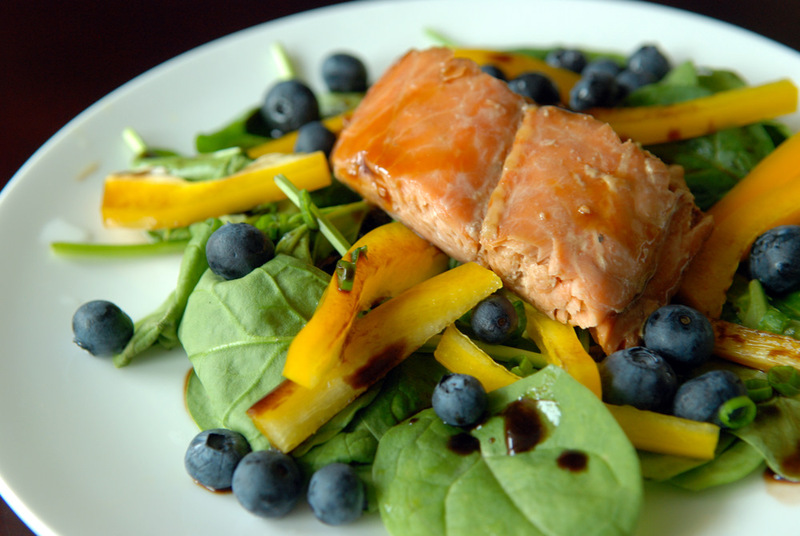 Baby spinach is the base, and it is topped with sliced bell pepper for some crunch, blueberries for tart-sweetness and green onions for a bit of zip. The salmon teriyaki (I had mine chilled, but warm would be great, too, if making it fresh) is plated on top and then balsamic vinegar is drizzled overtop. I was going to add toasted almonds, too, but forgot. By the time I remembered, I was already through half of the salad. The bell pepper conferred enough of a crunch so I didn’t miss it. Don’t forget, this is another option for leftover salmon teriyaki: Salmon Teriyaki Miso Soup with Udon and Spinach. This is being submitted to this week’s Weekend Herb Blogging, hosted by Yasmeen from Health Nut, to this week’s Ingredient Challenge Monday for blueberries and to this month’s Monthly Mingle featuring pink foods. When I visited Japan two years ago, I swooned after I ate my first takoyaki. I describe them as octopus balls: a piece of octopus is coated in a savoury batter and cooked. Smothered with a Japanese barbecue sauce, mayonnaise and sprinkled with bonito flakes – it is nothing I ever thought would taste so good. 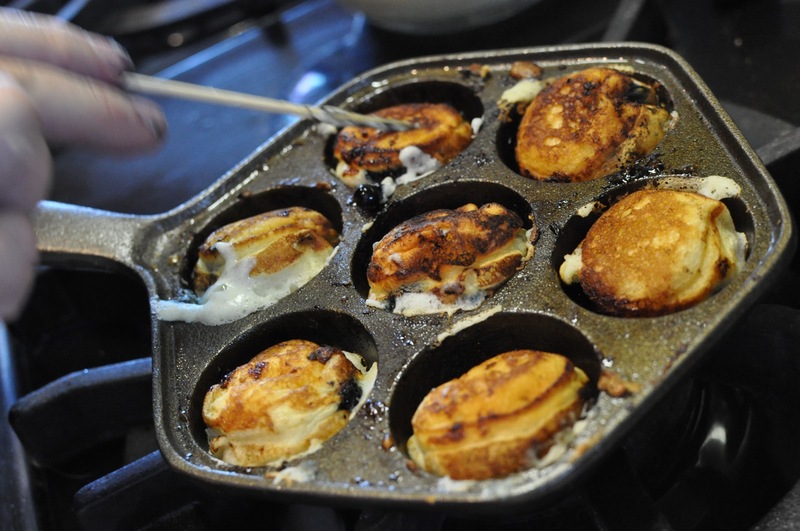 When I visit restos, I prefer to order things I can’t make at home, so my go-to dish at Guu and Kenzo’s is takoyaki. 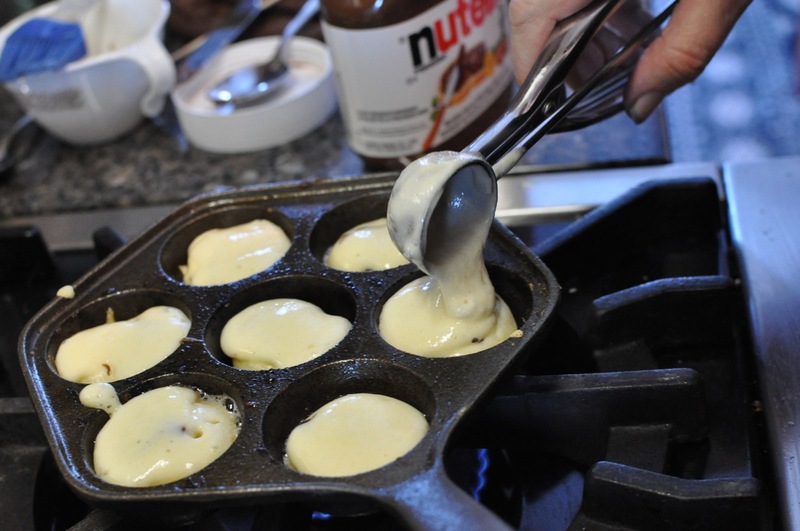 Once I came back to Canada, I wished I could recreate it at home, but you need a special pan with round grooves to make the round balls. The restos were the only way to get my takoyaki-fix. Until now! 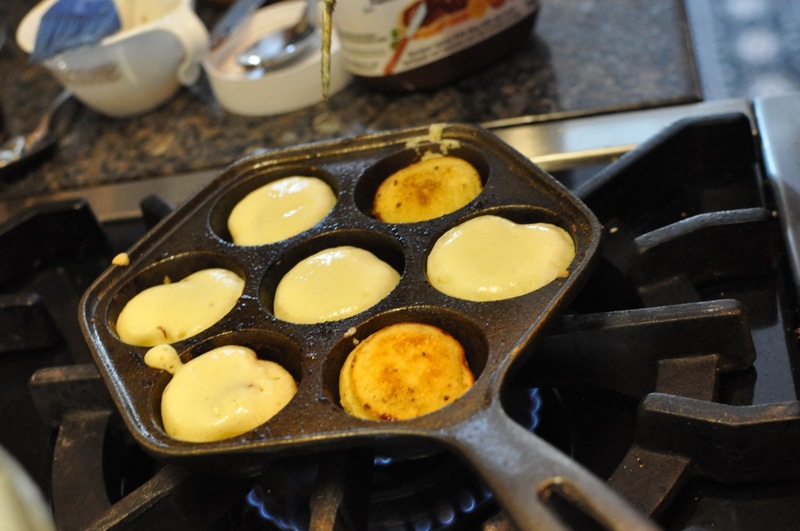 One of my Christmas gifts this year was a takoyaki/aebleskiver pan! Not soon after Christmas, I whipped the pan out for its inaugural use. Not for takoyaki, though. I had no octopus, you see. 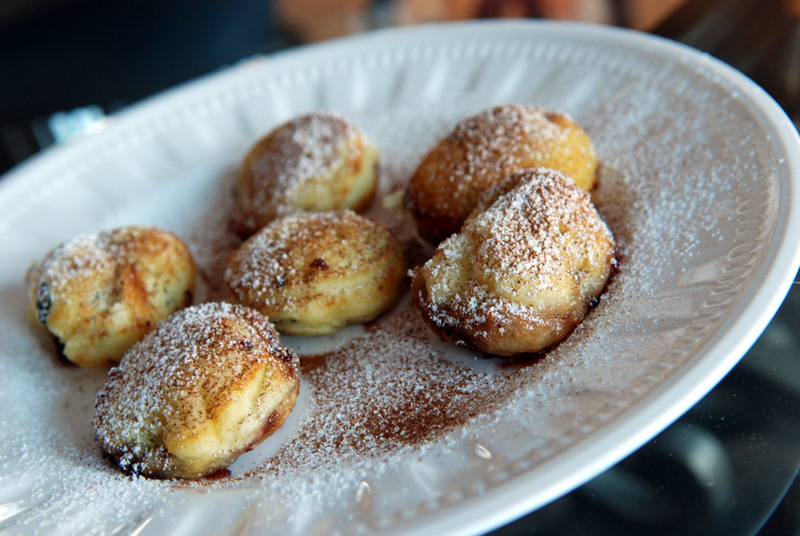 Instead, I made Danish stuffed pancakes, also known as ebelskiver, ebleskiver, aebleskiver, or æbleskiver. These are light, fluffy, round, buttermilk-based pancakes stuffed with your favourite filling. My tip is not to overstuff the pancakes because leaking quickly leads to a dirty pan that is hard to clean! I adapted Williams-Sonoma’s recipe to experiment with different fillings. 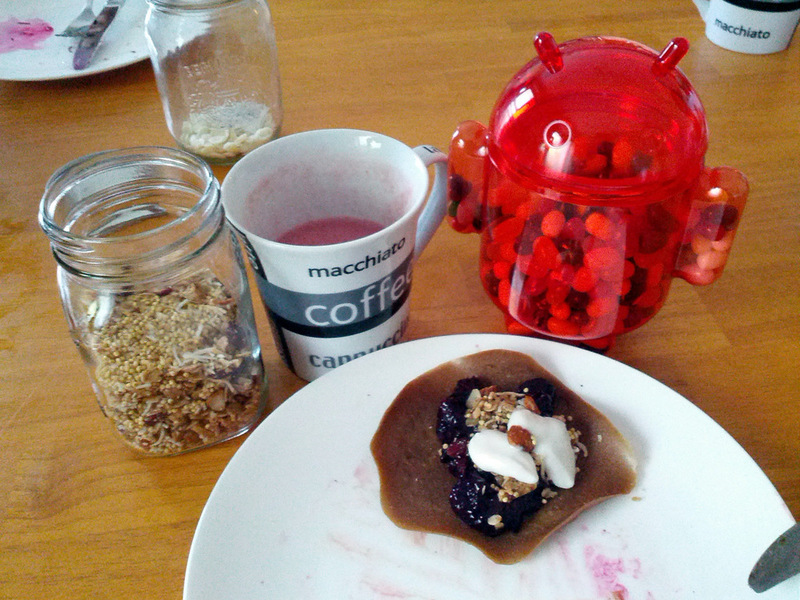 We started with blueberries, which were probably my favourite filling. 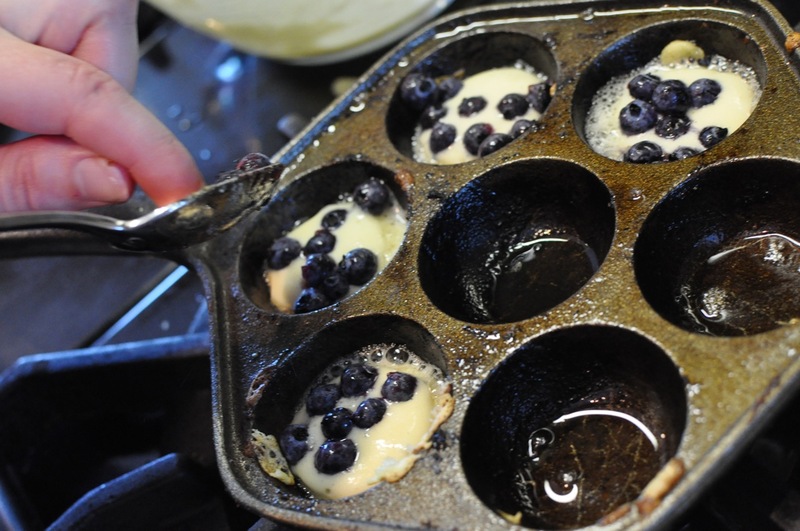 Frozen blueberries can be used but are best when they have thawed. Otherwise, they change the temperature of the batter and it doesn’t cook as well. 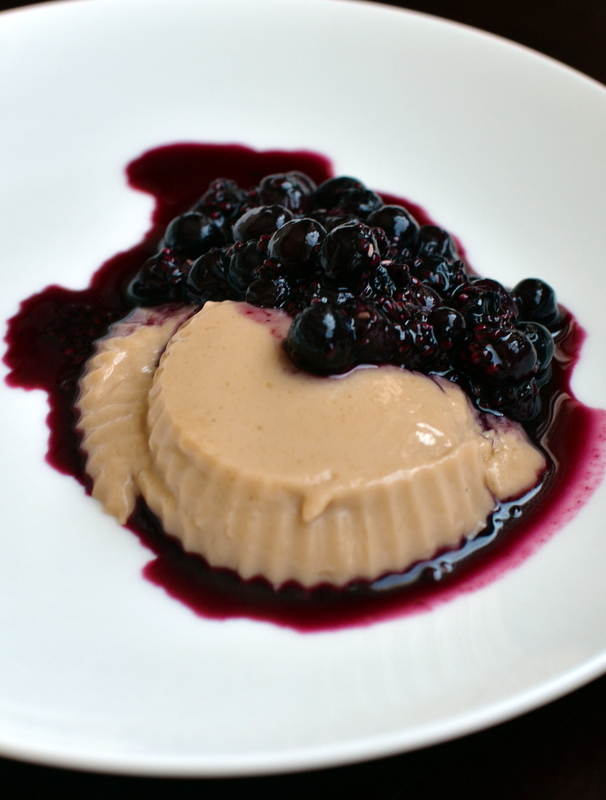 Next, we tried mulberry jam as a filling. It was delicious, too, although much sweeter. The only trick is to make sure it doesn’t leak while flipping because it is a bugger to get the jam off the pan. Lastly, I pulled out the big guns: Nutella. Oh yeah, melted nutella inside light, fluffy pancakes, topped with a shimmer of icing sugar and cinnamon: heavenly decadence. This is my submission to this month’s My Kitchen, My World, featuring dishes from Denmark and to this month’s Breakfast Club for Sweet Treats. Also props to Rob, for the action shots since I can’t cook and photograph at the same time. I know it is now mid-September. The kids have gone back to school. My century ride last weekend was called “Summer’s End Century Tour” and yes, I have started to wear a jacket while cycling to work. I will have to abandon my cycling shorts, too, because it is pretty frigid with the wind in the mornings and evenings. I even close my balcony door at night, which has been on perma-open since May. I think fall is here. *Bestwin has butternut squash on sale for 17 cents/lb this week. I may be stocking up afterall! 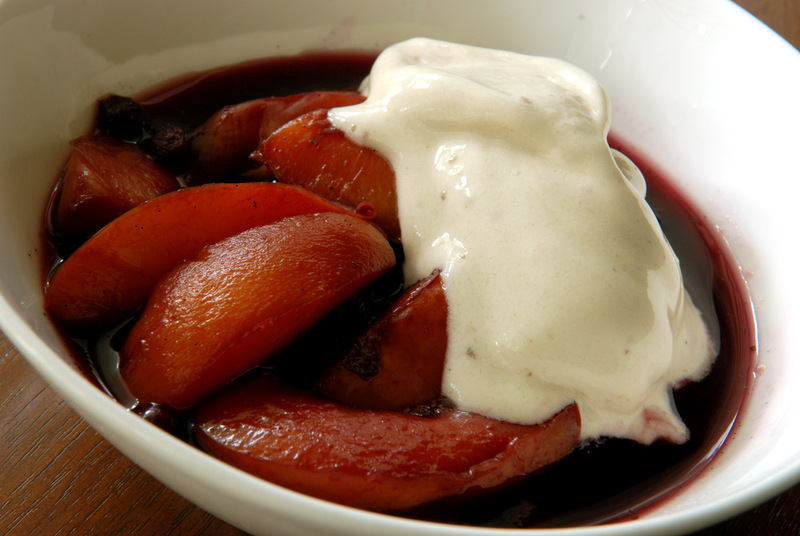 **Frozen fruit would work well if baking this out of season. 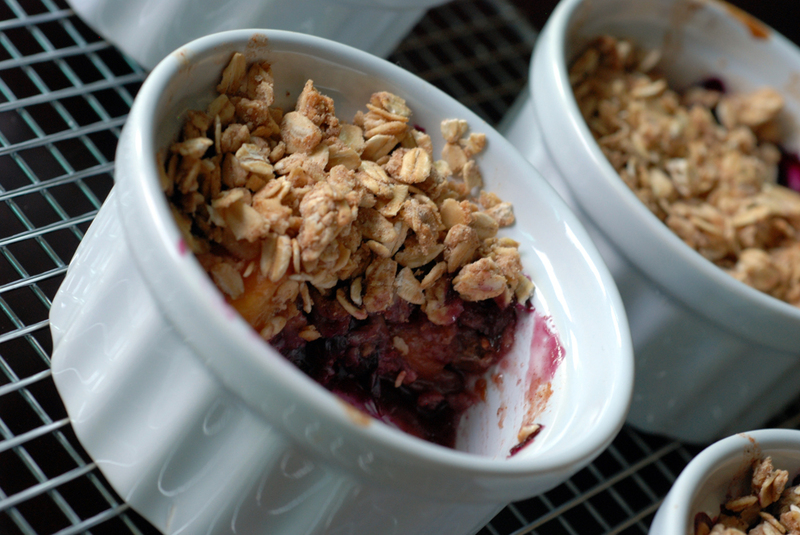 I know everyone already has a favourite crumble, crisp or cobbler recipe – usually the one that Mom made. But when I spotted this on Joy the Baker, I was intrigued by the combination of fruit and spice. 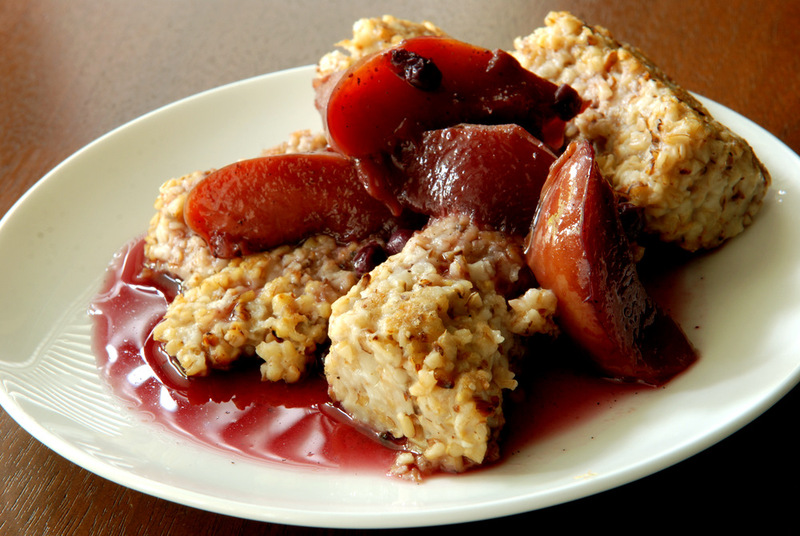 Peaches and blueberries work well together, but how would it work with raspberries? (And why would I even consider baking with fresh, juicy, light raspberries?? I must be mad!) But Joy paired them with cinnamon, nutmeg and maple syrup, which was a match in heaven. The raspberries were a nice sweet/tart addition to the fruit trio and I enjoyed how they all worked well with the nutmeg and maple. 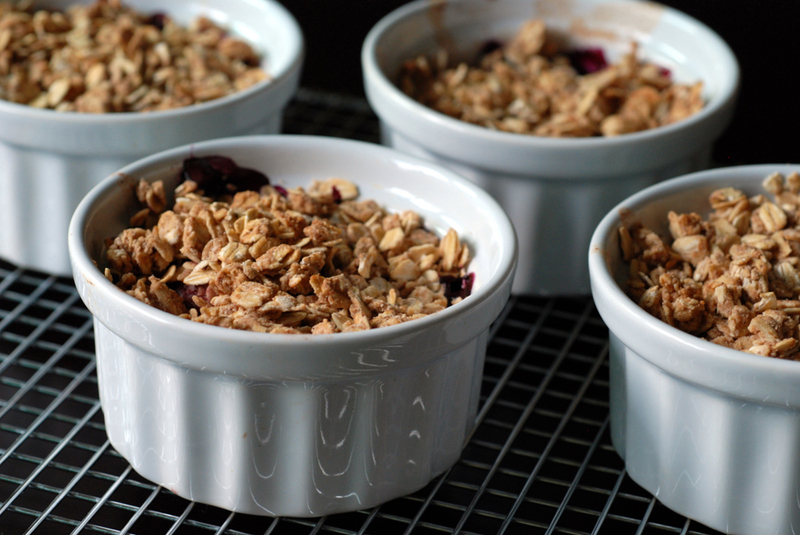 This recipe, coupled with Whipped Banana Oatmeal with Cranberries, is my entry to Blog Bites 7, Iron Chef-style, where we use one ingredient two ways! My ingredient: oats!